Hi, everybody! 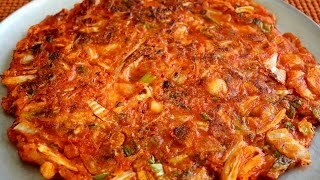 I’m going to introduce 2 kinds of kimchijeon to you today: chopped kimchi pancake and non-chopped kimchi pancake. The kimchijeon made with chopped kimchi is very easy and simple to make. You don’t need any special ingredients as long as you have some kimchi in your fridge. I usually make this style of kimchijeon at home. Have you ever seen this kind of kimchijeon? My late grandmother used to make it for us. I thought this style of kimchijeon looked very special when I saw her cooking this pancake for the first time. I remember what I thought when I saw her making this pancake: “Hmm, grandma treats the kimchi leaf like a slice of fish? Interesting!” but I never told her what I thought. I just watched what she was doing. I miss my grandmother now. She would be so proud of me if she knew I was posting her recipe here! In the video, I’m showing how to cut the big round chopped kimchi kimchijeon (12 inches wide because my frying pan is 12 inches wide) into bite sized pieces, but as I mentioned in the video, you could serve it right out of the pan without cutting. It’s usually served as family snack that way. Use your chopsticks to tear a piece of the kimchijeon from the plate. It may be difficult to do alone because the rest of the kimchijeon should remain on the plate for everyone else. So one of your family members should grab the pancake with her or his chopsticks so you can tear more easily. Helping each other is very important when you eat this way! If you cut it into bite sized pieces, it’s usually served as a side dish. It’s a popular side dish for lunch box, too. Kimchi, onion, salt, sugar, flour, vegetable oil. In a bowl, place 1 cup of chopped kimchi, 3 tbs of kimchi juice, 2 tbs chopped onion, ½ ts salt, ½ ts sugar, ½ cup flour (all purpose flour), and ¼ cup of water and mix it well with a spoon. Heat up a 12 inch non-stick pan over medium high heat and drizzle about 2 tbs grape seed oil. 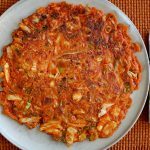 Place the mixture of kimchi pancake batter on the pan and spread it thinly and evenly with a spoon. Cook it for 1 to 1½ minutes until the bottom gets golden brown and crispy. Turn it over with a spatula or flip it. Lower the heat to medium and cook for another 1½ minutes. Turn it over one more time and cook for 30 seconds before transfering it to a serving plate. *tip: Serve it right out of the pan or cool it down and cut it into bite size to serve. Kimchi, ground pork, tofu, onion chives (or green onions), onion, salt, black ground pepper, sesame oil, egg, flour, grape seed oil. Prepare 6 or 7 kimchi leaves (6 to 7 inches long, or 16 cm) and ½ cup flour in a plate. Coat both sides of each kimchi leaf in the flour by hand. In a small bowl, add 2 tbs ground pork (or beef), 2 tbs tofu (after gently squeezing out excess water with a paper towel), 1 ts chopped onion chives (or green onion), 1 tbs chopped onion, a pinch of salt and black ground pepper, 1 ts of sesame oil, and mix the mixture well with a spoon. Place 1 egg in a small bowl and add a pinch of salt. Beat it with a fork. Add some of the meat-tofu mix on one side of a kimchi stem. Add some flour on top of the mixture. Put some of the meat-tofu mix on the rest of kimchi leaves. Heat up a non-stick pan and add some grape seed oil (or vegetable oil). Coat each kimchi leaf with beaten egg mix and place on the heated pan. When the bottom of the kimchi pancake turns golden brown (1 or 1½ minutes), turn it over and cook another minute. Turn it over one more time and cook another 30 seconds before transfering it to a serving plate. Posted on Thursday, July 15th, 2010 at 11:14 am. Last updated on November 14, 2015. Posted November 19th, 2018 at 5:25 pm | Log in to reply. Delicious! Your grandmother would be very proud of you. Posted October 12th, 2018 at 10:18 am | Log in to reply. Just curious, could this recipe work with daikon kimchi too? Posted August 30th, 2018 at 8:16 pm | Log in to reply. Thank you so much for sharing your kimchijeon recipe! I made them tonight and they tasted delicious! Just one question so I can improve the next time I cook them, do you have any tips to make the pancakes crispier? Thank you! Posted September 5th, 2018 at 9:17 am | Log in to reply. Yes, adding generous amount a cooking oil will make the pancake crispier. Make sure the oil is in the center. You may have to lift up one edge of the pancake with your spatula and tilt the skillet so the oil flows underneath the pancake to the center. Cook until the both sides are crispy. Posted July 11th, 2018 at 12:06 pm | Log in to reply. Posted June 21st, 2018 at 3:11 am | Log in to reply. Posted June 28th, 2018 at 7:37 am | Log in to reply. It looks so yummy! I love your green onion garnish! Posted May 13th, 2018 at 6:10 am | Log in to reply. Posted June 2nd, 2018 at 3:43 am | Log in to reply. It’s such a perfect looking kimchi pancake! Yum! Posted April 20th, 2018 at 5:30 am | Log in to reply. Tried this recipe with homemade kimchi and turned out delicious! Thank you so much Maangchi, MUA! Posted April 24th, 2018 at 8:35 am | Log in to reply. Posted November 5th, 2017 at 3:37 am | Log in to reply. Hi Maangchi! I have one question. I haven’t grape seed oil and actually I’m not sure that I can found it in our supermarkets cause it’s not popular oil in Russia. Can I use usual sunflower oil or is it bad idea? I also have sesame oil, but I’m not sure that I can use it for cooking on stove. Posted November 7th, 2017 at 8:05 am | Log in to reply. Yes, you can use sunflower oil, corn oil, or vegetable oil. Sesame oil is not good for frying, that’s why I often add a few drops at the end. Posted February 23rd, 2018 at 10:08 am | Log in to reply. I love using avocado oil for high heat cooking. It’s healthier then vegetable oils, can stand up to 500 degrees F and has no flavor! Posted July 31st, 2017 at 12:31 am | Log in to reply. This recipe was originally posted on July 15, 2010 at 11:14 am by Maangchi. It was last updated on November 14, 2015. The video was watched 1,485,144 times on YouTube & has 13,886 likes!